LAISSEZ LES BON TEMPS ROULEZ! IT'S MARDI GRAS! Well, it’s Mardi Gras again. Now what’s a transplanted southerner living in Los Angeles to do? Why head down to the Farmer’s Market on Fairfax, of course! Every year, The Gumbo Pot at the market hosts a Mardi Gras celebration complete with live music, bead throwing, face painting, dancing, hat making for the kids, and special recipes for red beans and rice, crawfish, catfish, cornbread, and jambalaya. Delish! As I sat with friends in the crowded market sipping a Blackened Voodoo, I wondered who started this rockin’ southern holiday, one so popular it’s even made its way to this little corner of Los Angeles. So I did a little research when I got home. In 1699, Mardi Gras came to the South with the French explorer Iberville who sailed into the Gulf of Mexico and set out on an expedition up the Mississippi River. On March 3, he set up camp on the west bank of the river, sixty miles south of New Orleans’ current location. Mardi Gras was being celebrated in France on this day, so, in honor of this important French holiday, Iberville named the site Point du Mardi Gras. While New Orleans was in French hands, masked balls and festivals were plentiful. Unfortunately, once New Orleans fell into Spanish hands, the celebrations were banned. In 1803, the United States annexed New Orleans, and by 1823 the Creoles persuaded the government to permit masked balls. Four years later, street masking was legalized. At the beginning of the nineteenth century, Mardi Gras was made up of maskers on foot, on horseback, and in carriages running around town actin’ crazy. 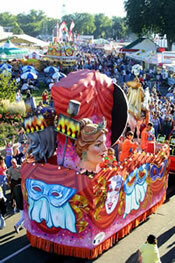 The first organized parade didn’t take place until 1837, and the next two decades built Mardi Gras’ bad reputation due to persistent street violence during the festivities. Indeed, the rowdiness got so out of hand that the press demanded an end to the partyin’. In the mid-nineteenth century, six New Orleans citizens rescued Mardi Gras when they started the Comus organization (the first krewe), adding the secret Carnival society along with beautiful floats and balls. They created a safe yet festive atmosphere. These six men were former members of the Cowbellians, an organization that had New Year's Eve parades in Mobile since 1831, so they knew how to throw a party and control a crowd. Mardi Gras was suspended during the Civil War, but in 1866 it returned with a vengeance. People were tired of war and deprivation and wanted to party! What about the king cake tradition, you might ask (I posted a recipe for the beloved cake below!). In 1870, the Twelfth Night Revelers formed, and the very next year they began the custom of presenting a young woman with a golden bean hidden in a cake. This young woman was the first queen of Mardi Gras, and this moment started the king cake tradition. In 1872, the krewe of Rex made their debut and began the tradition of the "King of Carnival." They also introduced purple, gold. and green as the official colors of Mardi Gras and "If Ever I Cease To Love" as the Mardi Gras anthem. Roll out the dough to make a long hot dog. Shape the roll into an oval and put it on a cookie sheet. Hide the baby in the dough. Cook it according to the package directions. While it’s cooking, use the food coloring to dye your sugar. Make one part purple using blue and red, one part green, and one part gold using yellow. When it’s finished cooking, ice the tops with the white icing. Sprinkle the different colors of sugars alternating as you go around the oval. Slice it. Whoever gets the baby has good luck all year and has to bring the King Cake next year.